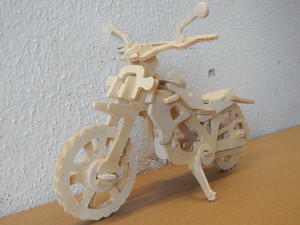 Wooden motorcycle puzzle project and free dxf file! I thought I would try my hand at a wooden motorcycle puzzle but i ran short of time and couldnt post the free dxf files here in this post. I will add them later to the download section or you can email me with your request. Anyway here it is after a short study i decided to copy a honda cbx 250 dirtbike for this project. it turned ou pretty good but the pipe and the motor ar missing in the picture. until i get it up check this out here its not a wooden motorcycle but its pretts cool and allows you to practice a little if you have already a cnc machine. i did it in a couple minutes and you can too. but as for the motorcycle i promise i will get it out to you as soon as possible. Well this is the first post of many and i plan to post a new model every week or so with a free dxf wood plan for the project in our free downloads section. 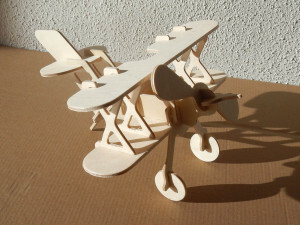 The bi-plane wood jigsaw puzzle is the first model that i am showing and to be honest i just found it in one of my drawers and thought that if i had to start somewhere, this would give me the motivation to do it! Hello and welcome to my blog about 3d wood puzzles that you can make at home with your cnc machine. If you have any questions dont hesitate to ask me directly or leave a comment.